TERRY, Alfred Howe (1827-1890) was a Union general in the American Civil War and the military commander of the Dakota Territory from 1866 to 1869 and again from 1872 to 1886. In 1865, Terry led Union troops to victory at the Second Battle of Fort Fisher in North Carolina. 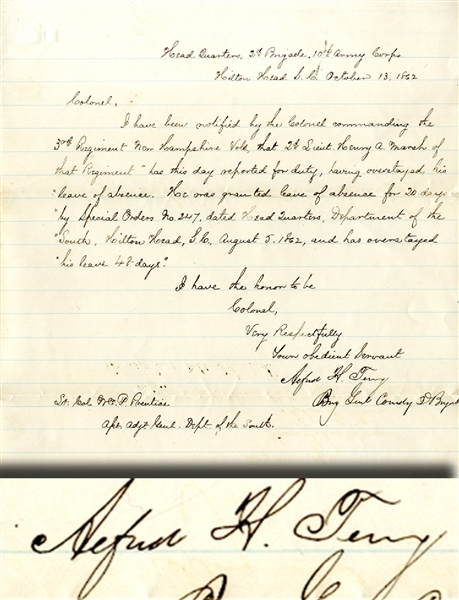 War-date Autograph Letter Signed “Alfred H. Terry” Brig. Genl. Comdg. 2d Brigade, 1pp. quarto, Hilton Head, South Carolina, October 13, 1862, addressed to Lt. Col. William Prentice, and reads in part: “...I have been notified by the Colonel commanding the 3rd Regiment New Hampshire Vols. that 2d Lieut. Henry A. Marsh of that Regiment has this day reported for duty, having overstayed his leave of absence...” Docketed on verso by Lieutenant Israel Sealy of the 47th N.Y Vols. Fine condition.